The summer is nearly halfway through, but that doesn’t mean we’re going to slow down on trying out the season’s biggest trends. We love having a few tricks to keeping cool up our sleeve—and so do our Stylists! Check out their breakdown of the best ways to wear summer’s most scorching (but sometimes tricky!) trends. See what our Stylists have to say about the summer’s trickiest trends! “Rompers and jumpsuits are the most comfortable go-to item in your closet! Break up your romper or jumpsuit by donning a belt, which will also accentuate your natural waistline. Top off your look with simple accessories—a jumpsuit is a statement piece in its own right.”—Sheri F.
“Whether you’re an ivory gal or you gravitate towards bright, crisp white, stick with one shade for your entire ensemble. Go all-in with white jeans, a white tank and a white denim jacket. A splashy swipe of coral lipstick will pop against your fresh whites!”—Christina K.
“When it comes to flowy pants and shorts, striking a proportional balance is the key to looking on-trend instead of looking like you’re venturing out in pajamas. Don’t be afraid to go bold with patterned shorts or pants. Keep it simple on top with a solid color fitted tank or tee and let your pants take center stage.”—Erika L.
“Cutoffs paired with a classic tee and comfy sandals are the epitome of ease when it comes to keeping cool (and looking it). But this trend isn’t just for the casual—elevate your look by front tucking a silk blouse into your shorts and add simple jewels for a chic, dinner ready ensemble.”—Brittany M.
“Patchwork denim has arrived on the scene as this season’s boldest boho trend. 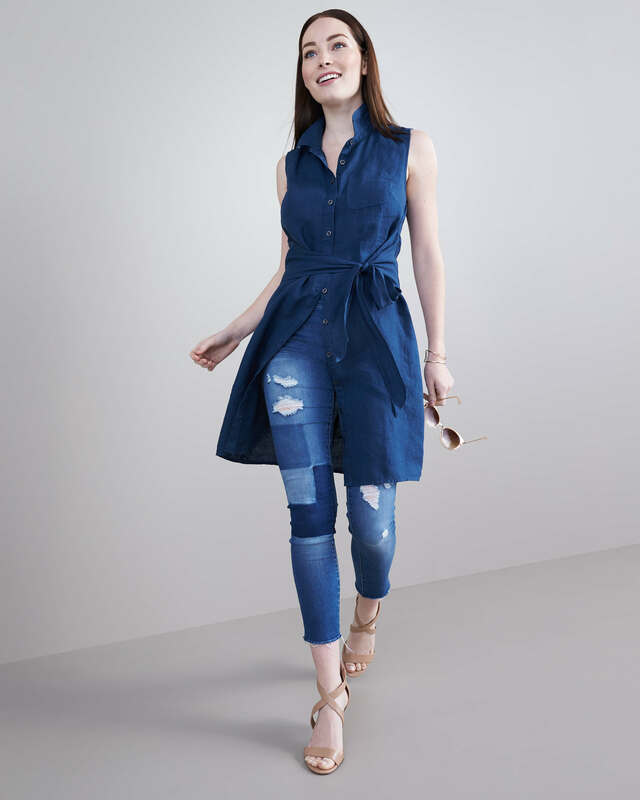 Opt for a pair with patches in multiple shades of blue, and pair with a solid colored tee or blouse. If you’re feeling crafty, DIY devotees can add their own (hello, recycled denim! 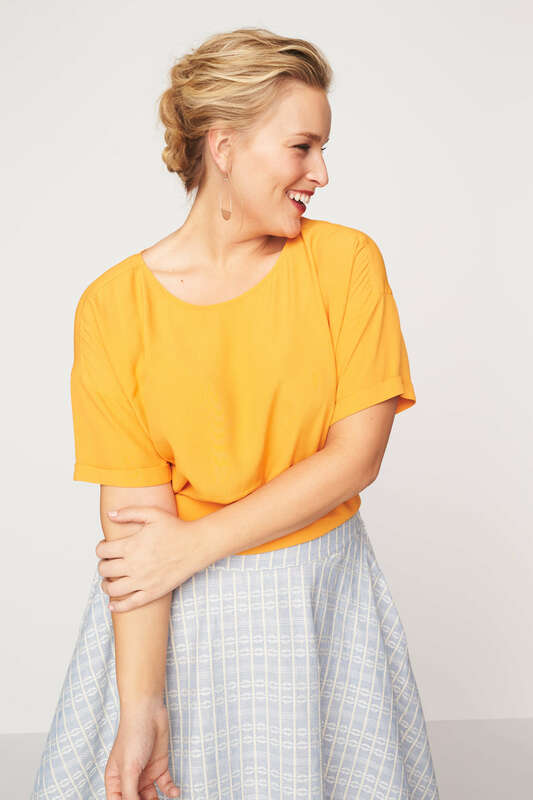 ).”—Stephania S.
“Yellow is a great way to add a pop of sunshine to your look. Choose a shade that complements your skin tone. Cool toned? Go for bright yellow. Warm toned? Go for goldenrod. Pair with neutral colors like camel, charcoal grey or black.”—Elizabeth W.
“The chic middle child of the mini and maxi, the midi combines both function and fashion. Ideal for downplaying your legs, opt for a midi dress in a solid hue that will elongate your figure. Prefer a print? Try a vertical striped midi skirt to give the illusion of a longer line.“—Emily D.
“Show off your shoulders and your style savvy by half tucking a cold-shoulder top into your favorite denim shorts with a pendant necklace and lace-up sandals as an effortless way to play it chic this summer.”—Baylee G.
Want to know more on how you can style tricky trends? Head to Ask a Stylist to do just that!